Telus or Shaw for High speed? The area I am in can get Telus 50 and shaw 50, but who is better to go with? or is there really no difference. or is there really no difference. I've found that Telus has really upped their game with respect to customer service lately. I recently had Optik and Internet installed and was impressed. The installer was here on time and done within an hour, and I was on hold for five minutes in total on the phone. I have had shaw high speed since odd two or so and it is up more times than down, and every once and a while I call shaw and get them to lower the price for a while. When I need service a guy comes in a specified 3-4 hr window. Interesting, yeah the whole contract thing is a little odd to me. But that seems to be the only way to go right now. I have both, Telus (100) at home and Shaw (150) in a now rental, So far I find Telus to be far more stable and doesn't ever slow down, I haven't tried the new 150 from Shaw as I bumped it up for the tenants but I suspect it would still have periods where it slows down. I here upload speeds are far better with Telus but I don't really have a need for it. I guess it's important for gamers etc. At speedtest.net I got this result, I think this is fast? Edit: LOL, I missed the part where it says A+ and faster than 96% of Calgary users, yeah it is fast! Last edited by Snuffleupagus; 01-29-2017 at 04:09 PM. Telus by far. I cancelled Shaw as I was tired of the internet constantly cutting out. Telus is much faster and more reliable. hmm, yeah we would game, and use an android box for streaming. I hear that shaw has issues if more then one person is using the internet.. not sure how much of that is truth or just fluffy bs. 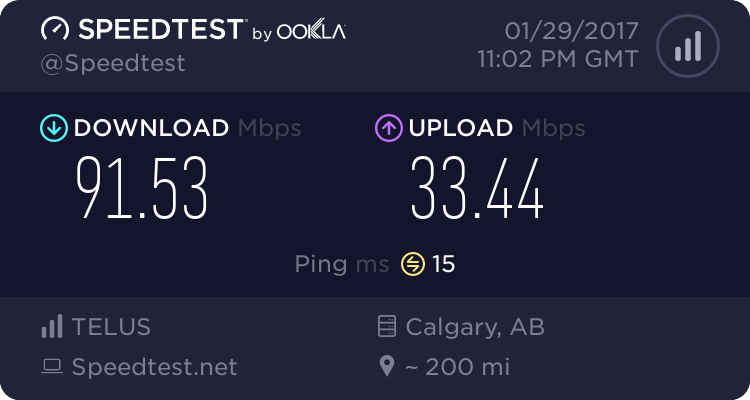 The upload speed is better on Telus, but only if you have fiber connectivity in your area. Most areas of Calgary do not have this yet. Telus 150 is 150 down and up. That and its rock solid with no slowdowns. I think if you can get Telus 150 it is hands down the best choice. We switch back and forth. Most recent switch to shaw has been a pain. It slows or outright craps out a few times a month. Once we went 2 days without phone cable or tv. That sucked. Maybe just bad luck or our neighbourhood, not sure. I must be one of the lucky ones Shaw has been rock solid and always over 150 /15. And I agree having Shaw go wifi is icing on the cake, don't need to use my Koodo data as much as I used too. I can get 150 with a hardwire connection, but my Wifi is usually around 80mpsnwoth Shaw 150.
ps, the anecdotal replies without citing specific location are fruitless. As close as you're getting to my specific location. Last edited by keratosis; 01-29-2017 at 08:59 PM. Telus - hands down. I get 150MBps DOWN AND UP. Having 150mbps upload is great for cloud based stuff like icloud, server backups, etc. Definitely recommend Telus. I've had a great experience with Telus. I've got their PureFibre service with 150 Mbps up and down and whenever I'm downloading...uhhh...Linux ISOs....I always get those speeds (usually a bit higher). I've been happy with Shaw where I am for more than a decade, there were a few times I wasn't getting my proper speed but they were always addressed. The worst was once when it took a few weeks for them to complete some upgrades for me to get my full upload speed. That said I'd really like to try the Telus symmetrical 150, but not available in my area. Heck I wouldn't be surprised if Telus's website still didn't even know Chestermere existed. EDIT: Nope, their website still blows up on my address.